In the Western African country of Niger, the official justice system of this former French colony is based on the Napoleonic Code. A small percentage of the population still subscribe to superstitious beliefs and seek the advice of traditional healers. But in this largely Muslim nation, many citizens seek justice from the local Islamic judge, or 'Cadi,' who interprets Koranic Law. 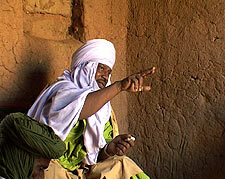 Filmed in the village of Agadez in northern Niger, JUSTICE AT AGADEZ chronicles seven typical cases heard by the local Cadi. The film unobtrusively witnesses these seven 'stories'-small civil disputes, domestic conflicts, marriage problems, accusations of theft. With the small vestibule of his home serving as a 'courtroom,' the Cadi listens to the complaints and often heated arguments of all parties to the dispute-sometimes just a husband and wife but at other times a room full of shouting people-listening patiently, frequently posing questions and seeking clarification, before rendering his judgment. JUSTICE AT AGADEZ not only demonstrates the power of Islamic religious beliefs in enforcing both moral and civil behavior but also provides viewers a rare opportunity to see how Islamic law, unlike the manner in which it has often been sensationalized in the Western media, actually functions on an everyday basis.